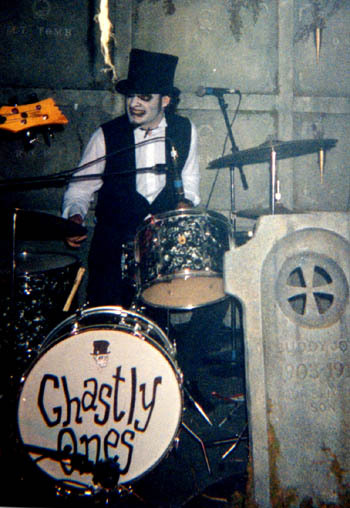 Interview – Baron Shivers – The Ghastly Ones | Krash Boom Bam!!! Ringo Starr, Dennis Thompson of The MC5, Ron Wilson of The Surfaris, Tim Fitzpatrick of The Lively Ones, Dennis Wilson of The Beach Boys, Bill Ward of Black Sabbath, and both Tommy and Marky of The Ramones, just to name a few. What tips do you have to aspiring road warriors such as yourself? Don’t consider myself a Road Warrior, but my advice is… Don’t start a band! You’re in for lots of headaches, well, and some good times too, but mostly headaches. How long are you guys on the road a year? We don’t tour much at all. What’s your fave song that you have played on? Don’t really have a favorite to be honest. What cd is it from? My favorite CD of ours in general is “Unearthed”. It’s sort of a ‘Best Of” and we re-recorded earlier songs and many of them turned out better than the first versions. Which song of yours do you think defines your style? I don’t think about that at all, to be honest. I’m just trying to mimic what some of my favorite players do. Sometimes it works, sometimes not. Loud and fast, except on the slower songs. I play in bands in my down time. I do FX Creatures for the movies full time. What is your coolest road story? Opening for The Brian Setzer Orchestra on New Years Eve at The Warfield in San Francisco. We were just an opening act but it was a great vibe because it was a big New Years show and people seemed to really dig us. Setzer gave us a hearty congrats after the show too, which was awesome. What is your most horrid road story? Water from an overflowing toilet at a club that soaked everyone’s road cases. How is it playing with the ghastly ones? It can be a blast and a drag depending on the venue, the people at the show, the mood of the band, etc. Mostly it’s been pretty fun. Same thing I’ve been listening to for years… 60’s surf and garage music. Early 70’s Hard Rock, 70’s and 80’s Punk Rock. 60’s and 70’s movie Soundtracks. I don’t listen to much (if any) “current” music.